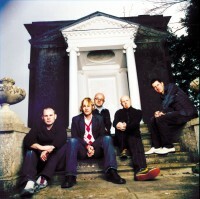 In the beginning there was The Cutting Edge Band, playing at a youth event at the band's home church in Littlehampton and there were small scale recordings to introduce people to the songs that were coming out of the hearts of Martin Smith and Stu G. Then there were hit-and-run gigs where the band would travel across the country to play at events. At this point The Cutting Edge Band all had day jobs so the routine was a little frantic. On August 30th 1995, Martin was driving back from a gig at the Grapevine Festival in Lincolnshire when, in the early hours of the morning and only around the corner from home, he was involved in a serious car accident. (The song "August 30th" on the 'King Of Fools' album was written about this event.) The crash turned out to be an important moment in Smith's life and the life of the band. Smith sits on the edge of the sofa at a hotel near a London airport as he remembers again the car journey and the crash. "What I remember most was that our drummer, Stu, and Sarah had just given birth to their first daughter and that was the whole reason we were rushing back from Lincoln. She was still in hospital and we wanted to see the baby. So that's how I know how many years ago it was because every time her birthday comes around it's just such a tangible reminder; every birthday." He reflects on the significance of the crash. "It was a good time looking back because it changed everything really. It went from doing this youth meeting at the weekends, Cutting Edge, where God was doing amazing things and then there was the crash where I nearly died. And for me it was, okay I've got my life back; so what are we going to do? It was an amazing time because it needed something that major to come into our lives for us all to suddenly say, well what are we all going to do? At the time Stu was running a successful design business, Tim and I were running the recording studio and happily getting on with that and Stu G was doing session playing. So to get five families to change direction with children and all that is actually a major thing. It's hard enough for one family to do that isn't it sometimes? So in all the wondering about what might happen and how we'd manage for money and the normal things you think about, I was polarised really to where I could say, 'I believe God is saying we should go for it.'" I ask Martin to go back in his mind and share what he remembers of the crash. "We'd driven from Lincoln," he explains. "It was about a four-hour journey and we were one road away from home in Rustington. I was going to drop Jon off at his mum and dad's house. Anna and I were married at that stage, so we were like, 'Great, drop Jon off and we'll be home soon!' I can only think that I just relaxed and thought, 'Oh I'm home now.' I've spoken to a lot of people and they say that's actually the most common time. I was stupid, I must have just fallen asleep at the wheel. I crashed into a wall and woke up with the dashboard of the car sort of up here." He indicates his chest. Martin pauses for a second as he recalls the accident and tears well up in his eyes. He composes himself and then continues, "Jon had a few bruises but at the end of the day they chopped the top of the car off to get me out. It took two hours to cut me out. I was awake in the car when they were cutting me out. But I was so drugged up by whatever they were giving me to help me." The conviction that he needed to go full time in music and that God had spared his life for a purpose began to slowly formulate while he was lying in his hospital bed. He says, "I'd already had an operation by the time I'd woken up. They were putting my leg back together. So that was the first I knew about the accident. I spent two weeks in hospital and someone, in fact Les Moir from Survivor Records, came to visit me and gave me a U2 book called At The End Of The World. I read that book and it was just so inspiring, about the journey they'd gone on. As all the lads from Cutting Edge visited me in hospital I said, 'You know this is it, I really want to go for this.' We gave ourselves three months to decide who was going to jump in. That's terrifying really. And everybody did. And then we had three months to fold our businesses down. So it was a six-month period. It was amazing looking back. We thought, well, we'll just do this for a year or so and see if we can do it. And 10 years have gone just like that. It's amazing really." One of the most extraordinary things about the Delirious? journey has been the way in which their songs have travelled around the globe and become popular in churches on all continents. It seems that just about everybody has a favourite Delirious? song! Another pivotal moment was the day that Martin Smith wrote the song "I Could Sing Of Your Love Forever". That song has done so much and opened up so many doors for him. It has also provided for him financially in recent years. Martin describes the writing of the song. "I can't even remember what year it is. It must be '94-ish time. We were on holiday as a family. We were in Devon, staying in an old farmhouse. It overlooked the sea and the hills and the mountains. It really was, sit on the edge of a hill, pre-kids, being able to dream a bit more, I grabbed an acoustic.cor, this is beautiful! The mountains, the sea.this is amazing! That song just wrote itself in about five minutes. The same chords the whole way through the song. I mean that's embarrassing really! It was just a little ditty. Did it at church. It was good but I don't think it really blew anybody away. It wasn't like, 'Oh Martin's written the most amazing song!' I still don't really think it is. But yes, that song, that moment changed our lives really. It's been one of the most sung songs in America and around the world. It's crazy really, this little ditty that we don't really do anymore. It's been great." My observation is that the song's royalties have acted as a real provision for Martin because when the song is sung in church, he receives a royalty. And when other artists have done versions of the song, again he has received royalties. The income simply supports Martin and his family and means that he is able to concentrate on writing more songs! Smith admits, "It's just been fantastic. I mean money is something we don't really talk about isn't it? Especially in interviews like this and with Christians, you know? It's the place you don't go. 'What sort of house does Graham Kendrick live in? Let's have a photo, like a paparazzi shot!' Would our opinion change if that was put on the front of Christianity Today? What car do we drive? Do we stay at a 3-star hotel or in a 5-star? Would this change our opinion? So it was something that I was highly embarrassed about in the beginning." He continues, "It's kind of 'uncool' to earn money, especially in our country. It's a sign of becoming 'less spiritual' if suddenly you have more money than you need. But in America it's actually a sign of being more spiritual because it's like, 'Oh, God is blessing you. This is wonderful!' I'm at a good place with it now in terms of I can do some great stuff! And I'm not just talking about, 'Yeah, we can do this and this at home. I can treat the kids.' I'm not really talking about that - although yes I do that. We live in a fantastic house. That is not the sort of house that a normal 35 year-old lives in. But even saying that, it has served its purpose in that we do loads of church stuff there. But the problem is you start talking that way and it sounds like you're justifying yourself. It's not that at all. God has given us the house that we need right now, more than we need, and it's fantastic. We've recorded the record in the back of it and it has served as a great resource." Reflecting on the way the scene has changed he says, "I think there has been quite a shift for a lot of writers in the UK, in the last five years. Things have come good for a lot of people that have written these songs that in England, really they just barely earn you a living. But now they've gone into America and the churches are singing them there. It's totally changed the whole landscape for people, especially my friends and the circle that I move in, it's changed their lives forever. People are all of a sudden thinking, 'Well hang on, I could start a church and resource it! Or I could do this and I could do that!' So I'm not saying that I have the answers or I've always done the right things, but it's been a positive thing." Financially, Delirious? look like one of the most successful British Christian bands ever. Not many bands from over here have done well in America. However they have also ploughed a lot of their money into establishing the Furious? Record label and Fierce! Distribution to support other artists. Obviously they generate income through concert performances and record sales and even CCLi income when their songs are sung in church but how do the band organise themselves financially? Smith explains, "Delirious? is five people. We are partners of Furious? Records and Delirious? So we own everything equally. It was a big decision to make in the early days. So we're five equal partners. We take the same wage. So anything that Delirious? does goes in the pot.touring, artist royalties.whatever we do as a band goes in the pot. And also the publishing as well. So all the publishing off our records is spread equally. The only different scenario for me and Stu G would be if someone covered a song. So if Amy Grant covers "Miracle Maker", then we made an agreement years and years ago that it would be fair for the writer who genuinely wrote the song to benefit from that because that is outside of what we do." He continues, "Now in the early days of course, we'd get all these big publishing advances from America and that would all go in but no one really had any idea that the third party income would grow so much. So I have benefited from that. But it's a situation that's worked well. I think the fruit of those decisions is that after 10, 12, 13 years we're still together because money can really screw the whole thing up. So I think had we been 16 or 17 at the time this all started I think we would have done the U2 model completely. But we all had things going on at the time. It was later in life for us. I'd already written songs by the time Cutting Edge started and was producing records and I think we were all at different stages. So I think that it's reflected our lives together pretty well. I'm not saying that we haven't had our 'conversations' but the fruit of it is that we're still together and love each other. I think it's been great." In 1997, one of the most important decisions that Delirious? made was in America. The band were shopping their 'Cutting Edge' and 'King Of Fools' albums around the American labels in Nashville trying to get a distribution deal. On arriving in Nashville, they were told in no uncertain terms that worship music didn't sell in America. Eventually signing with Sparrow Records, the label originally said they wouldn't release 'Cutting Edge' and actually wanted to begin by releasing the brand new 'King Of Fools'. The band dug in their heels and 'Cutting Edge' did become their debut release Stateside. The passage of time reveals that it was a very important decision, not least because 'Cutting Edge' has been their most successful album in the USA. "Yeah, that's the real irony and we do remind them of that every now and again!" Smith explains. "They wanted to put 'King Of Fools' out first because in their opinion 'Cutting Edge' was just 'badly recorded'.and it was. They were just demos really - church music. And at that time they didn't want church music, they wanted contemporary CCM, they wanted Newsboys, dc Talk. And we had to fit into that mould. So we released "Deeper" and of course that fitted that pop thing well and that became a big hit in America. And that really launched us. It was only after that they then released 'Cutting Edge' because that was part of the deal. We said, 'You've got to release that as well.' That really was partly the beginning of that movement out there. It's sort of sunk into the churches and those songs really did a lot of heart warming and heart changing. Ironically they never released "I Could Sing Of Your Love Forever" as a single. It took someone else to record it."